Locate the focusing frame in the Live View display. Face Priority: If the camera locates faces, you see a yellow focusing frame around each one. Note that one of the frames has double yellow lines. This indicates the face that the camera will use to set focusing distance. If you don’t see the highlight, the camera can’t detect your subject’s face, and it will set focus on the center of the frame. In Face Priority mode, you can use the Multi Selector to move the box with the double-yellow border from face to face in a group portrait. In the Wide Area and Normal Area modes, press OK to quickly move the focus point to the center of the frame. In Subject Tracking mode, press OK to initiate focus tracking. If your subject moves, the focus frame moves with it. To stop tracking, press OK again. In AF-S Focus mode, press the shutter button halfway to focus. If the camera can focus successfully, the focus frame turns green. You also hear a little beep (assuming you didn’t disable the beep, which you can do via the Setup menu). Focus remains locked as long as you keep the shutter button pressed halfway. For movie recording, you can release the shutter button after focus is set. In AF-F mode, check the focus frame. Again, you don’t press the shutter button halfway to focus in this mode; focusing occurs automatically. So just watch for the focus frame to turn green, indicating the camera found the focus target. (Optional) Magnify the display to double-check focus. 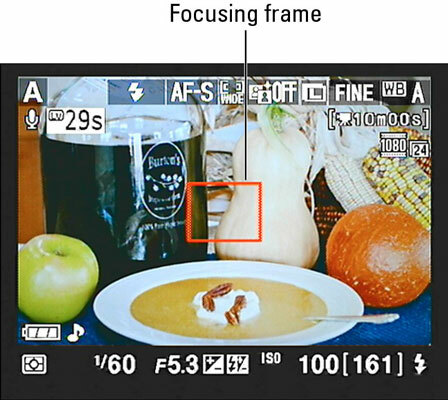 After setting focus, you can press the Zoom In button to magnify the scene and check focus. Each press gives you a closer look at the subject. 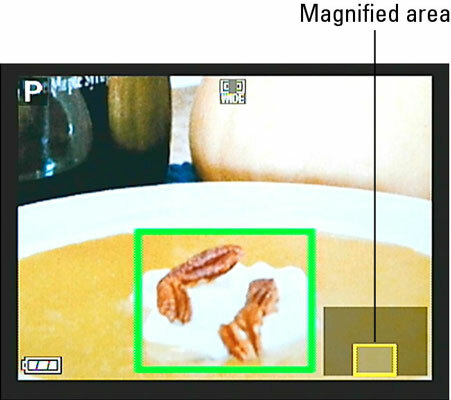 A small thumbnail in the corner of the monitor appears, with the yellow highlight box indicating the area that’s currently being magnified. Press the Multi Selector to scroll the display if needed. To zoom out, press the Zoom Out button until you see the entire scene. While the display is zoomed, you can press the shutter button halfway again to reset focus if needed — you don’t have to zoom out to take that step.